In this paper, the background, set-up, and a preliminary analysis of the survey conducted by the FIG joint commission 3 and 7 working group on 3D-Cadastre, 2010-2014 is presented. The purpose of the survey is to make a world-wide inventory of the status of 3D-Cadastres at this moment (November 2010) and the plans/expectations for the near future (2014). Sharing this information improves cooperation and exchange of experiences and supports future developments in different countries and cadastral jurisdictions. The FIG working group will repeat the survey in four years time to evaluate the actual progress. In the questionnaire the concept of 3D-Cadastres with 3D parcels is intended in the broadest possible sense. At the moment of writing, 36 completed questionnaires have been received. 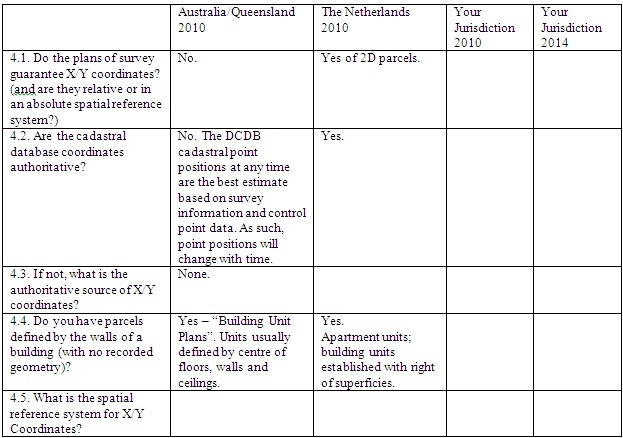 Another detailed questionnaire survey is being conducted among the eight cadastral jurisdictions of Australia, and the results from these are also presented and compared to the international situation. At the moment of writing, all completed Australian questionnaires have been received. In the past decade various activities have been conducted related to 3D-Cadastres. The start of the international awareness of this topic was marked by the workshop on 3D-Cadastres (sponsored by FIG commissions 3 and 7), organized by Delft University of Technology in November 2001. This was followed by virtually a session at every FIG working week and congress afterwards (stimulated by the 2002-2006 FIG working group on 3D-Cadastres). Within cadastral organizations this was paralleled by on-going developments at Cadastral organizations in many countries to provide better 3D-support. The increasing complexity of infrastructures and densely built-up areas requires a proper registration of the legal status (private and public), which only can be provided to a limited extent by the existing 2D cadastral registrations. Despite all research and progress in practice, no country in the world has a true 3D-Cadastre, the functionality is always limited in some manner; e.g. only registering of volumetric parcels in the public registers, but not included in a 3D cadastral map, or limited to a specific type of object with ad hoc semi-3D solutions; e.g. for buildings or infrastructure. 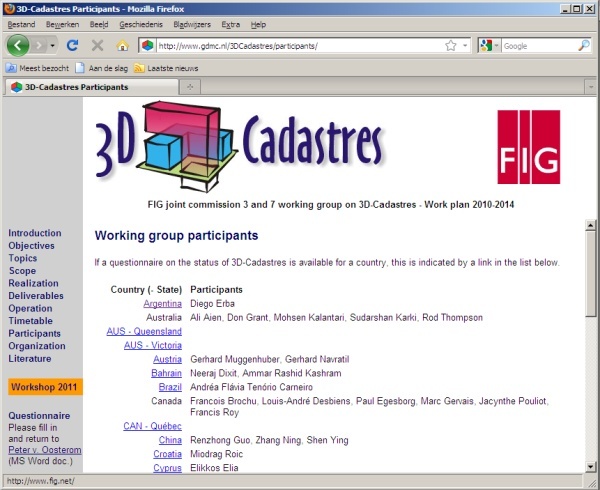 At the FIG Congress in April 2010 in Sydney it was decided to form again a working group on 3D-Cadastres in order to make further progress with the subject; see Section 2 for more details of this working group. The registration of the legal status in complex 3D situations will be investigated under the header of 3D-Cadastres. Starting point of the working group is the observation that increasingly information is required on rights, use and value in complex spatial and/or legal situations. What are the types of 3D cadastral objects that need to be registered? Are these always related to (future) constructions (buildings, pipelines, tunnels, etc.) as in Norway and Sweden or could it be any part of the 3D space, both airspace or in the subsurface as in Queensland, Australia? In case of (subsurface) infrastructure objects, such as long tunnels (for roads, metro, train), pipelines, cables: should these be divided based on the surface parcels (as in Queensland, Australia) or treated as one cadastral object (as in Sweden). In case of subdivision, note that to all parts rights (and parties) should be associated. For the representation (and initial registration) of a 3D cadastral object, is the legal space specified by its own coordinates in a shared reference system (as is the practice for 2D in most countries) or is it specified by referencing existing topographic objects/boundaries (as in the 'British' style of a cadastre). Note that there can be a difference between the 3D ownership space and the 3D restriction space; e.g. one can be owner up to ±100 m around the earth surface, but only allowed to build from -10 to +40 m. Both result in 3D parcels, that is, 3D spatial units with RRRs attached. The ownership spaces (parcels) should not overlap other ownership parcels, but they are allowed to overlap other space; e.g. restriction parcels. Part of the activities of the working group is to make a world-wide inventory of the status of 3D-Cadastres at this moment (November 2010) and the plans/expectations for the near future (2014); see Section 3. This will be done via a repeated questionnaire: one in 2010 (status 2010 and plans 2014) and one in 2014 (status 2014 and plans 2018). The repeated survey in four years time will be helpful to evaluate the actual progress. Sharing this information improves cooperation and exchange of experiences and supports future developments in different countries and cadastral jurisdictions. A related survey has been conducted among the eight cadastral jurisdictions of Australia (see Section 4). The results and preliminary analysis of the international FIG 3D-cadastres survey is presented in Section 5. Finally, Section 6 contains the conclusions and description of future work in the area of 3D-Cadastres. This section presents the FIG joint commission 3 and 7 working group on 3D-Cadastres (2010-2014). In subsection 2.1 the objectives of the working group are formulated. The main research topics of the working group are presented in subsection 2.2, while deliverables and mode of operation are introduced in subsection 2.3. For more information on the FIG working group on 3D-Cadastres, including the overview of relevant 3D cadastre literature and the 35 completed questionnaires, see the website of this working group www.gdmc.nl/3DCadastres. A common understanding of the terms and issues involved. 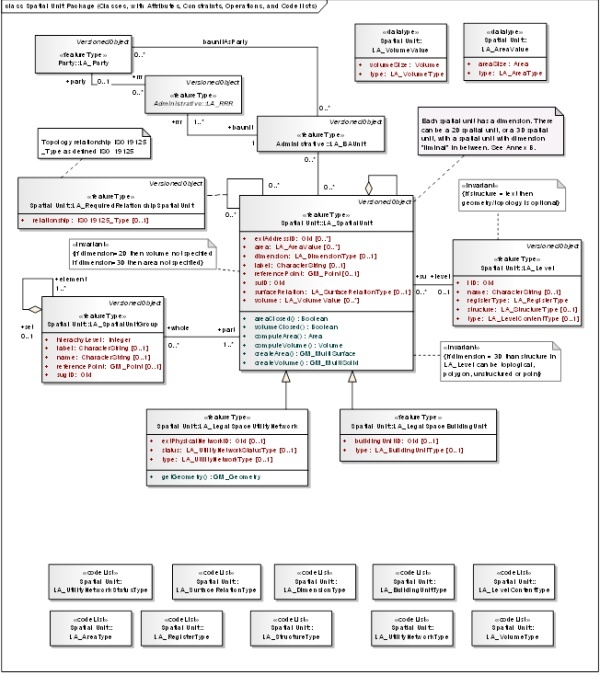 After the initial misunderstandings (due to lacking shared concepts and terminology) in the early days, the concepts should now be further refined and agreed on, based on the ISO 19152 Land Administration Domain Model (LADM, which provides support for 3D representations); see Figure 1. A description of issues that have to be considered (and to what level) before whatever form of 3D-Cadastres can be implemented. One could think of a checklist for the implementation of 3D-Cadastres. These will provide 'best practices' for the legal, institutional and technical aspects. These findings will be translated in basic guidelines for the implementation of 3D-Cadastres. By means of pursuing these issues we hope to have a fruitful exchange of ideas. There exists not a unique 3D-Cadastre. In all cases for the establishment of such a cadastre legal, institutional and technical issues have to be addressed. The level of sophistication of each 3D-Cadastre will in the end be based on the user needs, land market requirements, legal framework, and technical possibilities. Therefore, in line with ISO's LADM it is our objective to explore the optimal trade-offs between 2D and 3D cadastral solutions (the full replacement of a 2D-Cadastre by a 3D-Cadastre is not an issue, but we need to address the issues that arise in the transition zones). The working group will focus primarily on professionals involved in geo-information and cadastral issues in 3D. This community will also provide the contributors to the working group. Access to this interest group is open to all. Once the results become more tangible the FIG-community at large will be our public. Within the working group the concept of 3D-Cadastres with 3D parcels is intended in the broadest possible sense. 3D parcels include land and water spaces, both above and below surface. However, what exactly is (or could be) a 3D parcel is dependent on the legal and organizational context in the specific country (state, province). For example, in one country a 3D parcel related to an apartment unit is associated with an ownership right, while in another country the government may be owner of the whole apartment complex and the same apartment unit is related to a use right. In both cases there are explicit 3D parcels, but with different rights attached. A third country may decide not to represent the apartment units with explicit 3D geometries at all (and the 3D aspect is then 'just' conceptual). A more formal definition: A 3D parcel is defined as the spatial unit against which (one or more) unique and homogeneous rights (e.g. ownership right or land use right), responsibilities or restrictions (RRRs) are associated to the whole entity, as included in a Land Administration system. Homogeneous means that the same combination of rights equally apply within the whole 3D spatial unit. Unique means that this is the largest spatial unit for which this is true. Making the unit any larger would result in the combination of rights not being homogenous. Making the unit smaller would result in at least 2 neighbour 3D parcels with the same combinations of rights. 3D-Cadastres and models: It is important to realize that for registration, for storage/validation and for dissemination different models (all based on the shared ISO LADM semantics) may be needed and different types of users are involved. The modelling aspect includes the question of which spatial (esp. height) and temporal information should be used and how different types of users may interact (i.e. produce, archive, edit, analyze, and visualize, edit) with 3D-Cadastre? The 'users' belong to various categories; they range from professionals (which can be further subdivided in notary, real estate brokers, banks, water boards, utility companies, municipalities, cadastral employees, surveyors, etc.) to citizens (with various capabilities of owners/users: from computer illiterates to experienced web surfers/gamers). 3D-Cadastres and SII: The registration of legal objects (cadastral parcels and associated rights) and their physical counterparts (e.g. buildings or tunnels) result into two different, but related data sets, which can be very well accessed together via the Spatial Information Infrastructure (SII, sometimes also called SDI). This is already true in 2D, but even more so in 3D. By also showing some physical objects for reference purpose, the location and size of the legal objects will be clearer. 3D-Cadastres and time: A 4D parcel is defined as the spatio-temporal unit against which (one or more) unique and homogeneous rights (e.g. ownership right or land use right), responsibilities or restrictions are associated to the whole entity, as included in a Land Administration system. Homogenous means that the same combination of rights equally apply within the whole 4D spatial temporal unit. Unique means that this is the largest spatio-temporal unit for which this is true. Making the unit any larger (in 3D space or time) would result in the combination of rights not being homogenous. Making the unit smaller (in 3D space or time) would result in at least 2 neighbour 4D parcels with the same combinations of rights. 3D-Cadastres and usability: The graphic user interface (GUI) is an essential aspect when realizing 3D-Cadastres in practice. This includes investigation of interacting with true 3D cadastral data (specific user interfaces: 3D spatial and perhaps temporal aspects via animations or snapshot sliders). The existing quality of successful and popular user interfaces (such as Google Earth; see Figure 2) will be the starting point with specific attention for working with the main 3D legal object types (related to underground infrastructure and building/apartment complexes). A true 3D cadastral system with functions should be implemented and applied to demonstrate the possibilities in practice based on 3D visualization. How to distribute the 3D cadastral information (3D parcels and associated rights) to the citizens? How to represent and demonstrate the 3D geographic aspect, on paper (with different viewpoints) or on electronic media (interactive tools based on Adobe Flex or Flash)? The working group strives to obtain tangible results that have relevance to the cadastral practice. At the next FIG congress (2014) we want to publish a FIG publication on guidelines to establish 3D-Cadastres (a 'Primer on 3D-Cadastres'), addressing legal, institutional and technical issues. In 2011 a second workshop on 3D-Cadastres is planned (again in Delft, 10 years after the first workshop). In addition, at the FIG working weeks joint commission 3 and 7 sessions on 3D-Cadastes will be organized. Depending on the need and results, additionally a third workshop on 3D-Cadastres could be organized in 2013 or 2014 preferably in conjunction with another FIG meeting (working week, or commission 3/7 annual or congress). Each workshop will be accompanied by a brief progress report. The exchange of ideas and discussions will be facilitated by means of a website on 3D-Cadastres. Depending on the issues encountered in our first or second year of operation a survey of user needs (e.g. by means of a questionnaire) might be useful. At the FIG events in the past decade many people have expressed their interested in 3D-Cadastres. In order to push ahead it seems best if the specific themes of 3D-Cadastres (legal, institutional and technical) are lead by a limited number of experts (2-4) who elaborate on their subject. People can then join these groups for discussion and preferably contributions. Task of the chair is to start and encourage these theme-groups, lead the overall issues of working group, and trigger the necessary events. It seems wise to evaluate this way of working after one year. Communication during the projects will be done as much as possible by e-mail and via our dedicated website: www.gdmc.nl/3DCadastres; see Figure 3. At the end of each year a progress report will be available to all members of the interest group and our sponsors in commissions 3 and 7. The Table 1 shows the main events of the working group in time. The formal definition a 3D parcel is defined as the spatial unit against which (one or more) unique and homogeneous rights (e.g. ownership right or land use right), responsibilities or restrictions are associated, as included in a Land Administration system. As this definition is quite abstract, the questions were phrased with more descriptive and real world situations included to explain further. Also two example sets of partial/preliminary answers were included from Queensland, Australia and The Netherlands, to support the questions and to be of help when formulating the answers for other jurisdictions (see Table 2). Despite or due to these preparations during the period of completing of the questionnaire the organizers received two requests for clarification. The first group of questions refers to the applicable 3D real-world situations to be registered by 3D parcels. It also addressed the types of 3D geometries, which are considered to be valid 3D representations for these parcels. The second group of questions refers to the situation where an infrastructure network is considered to be defined within the cadastre. For example in some jurisdictions, an underground network might be privately constructed for the purpose of leasing space in it for other organisations to run cabling. In this case, a network, or part of that network may be considered to be a real estate object. The third group of questions refers to 3D properties that are related to constructions and apartment (condominium) buildings. The individual units are often defined by the actual walls and structure of a building, rather than by metes and bounds. E.g. “unit 5 on level 6 of … building”. The other 6 groups of questions are more or less self-evident. Finally, group 10 the contact details could be provided together with any other issue that was relevant, but not yet addressed by one of the earlier questions. Table 2. Sample form the 3D-Cadastres questionnaire (section 4. X/Y Coordinates) with example answer from Australia/Queensland and The Netherlands (for the 2010). The questionnaire was distributed among the member of FIG 3D-Cadastres WG and the members of FIG joint commission 3 and 7. The respondents were asked to complete the two empty columns for their jurisdiction: 2010 (the current status) and 2014 (expectations in 4 years time). The idea for a 3D-Cadastres questionnaire was first ‘born’ in Australia. Therefore we start by presenting these results. This questionnaire has been conducted among the eight cadastral jurisdictions of Australia: Queensland, Australian Capital Territory, New South Wales, Northern Territory, South Australia, Tasmania, Victoria and Western Australia (Karki, Thompson, McDougall 2011).. The results from these are summarised and compared to the international situation. Generally speaking, the states of Australia have different procedures, but attempt to have consistent regulations as far as the public is concerned. This is to ensure that “loop-holes” are not generated by state differences. Differences, when they occur, tend to be in the situations that have come into existence more recently. Thus the first question “Are all 3D parcels constrained to be within one surface (2D) parcel?” has elicited quite different responses, probably because situations such as the subdivision of a surface parcel which has a 3D parcel below it is still a rare occurrence. Alternately all allow parcels to be defined by a physical structure. All allow a wide range of parcel definitions (possibly including curved surfaces) providing a precise definition is made. Dealings involving 3D parcels are effectively the same as for 2D, but there are some additional restrictions on rights to units in strata. In the Australian context, all states support a “heaven to centre of earth” approach for rights on most parcels. There are parcels with restricted rights in the form of ownership rights or encumbrance in the strata. Sometimes even the rights or encumbrances in strata are sub-divided, amalgamated or nullified. However, distinction is made between a 2D parcel plan and 3D plan (Volumetric or Building Format). 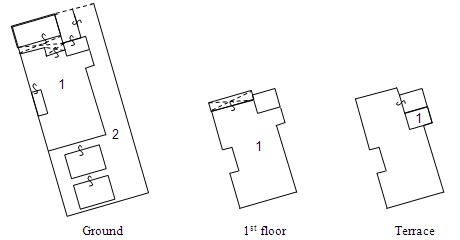 For a Building Format plan which is used to represent strata, the database records a 2D surface parcel outline and the various level details as attributes. For a Volumetric Parcel, easements or leases can be created for the whole parcel or part of the parcel above or below the ground. Constraints to be within the surface 2D parcel: In Australia, 2D parcels are subdivided to reflect 3D ownership, however if the 2D parcels are subsequently subdivided or amalgamated it does not affect the status of the 3D parcel with then may span several 2D parcels. 3D easements or leases may exist on part or the whole of a 2D parcel, may extend to other parcels, may be subdivided, amalgamated or wholly or partly extinguished and may have full or partial overlap with another interest. Empty Spaces or Existing Constructions: 3D rights are permitted as in the case of 3D easements, limited height parcels or Building Format parcels. For example, an apartment block which is demolished with the owners rights being reserved for a replacement on the same level and aspect but not the exact airspace as before. By contrast a parcel (e.g. a marina parcel) may be defined by its location in space without reference to any construction. Boundaries of the 3D parcel: The cadastral survey requirement is quite explicit in that the 3D parcel boundaries to be formed must be measurable or definable mathematically. Volumetric plans and Building format plans deal with strata quite differently. A Volumetric plan uses an absolute height (Reduced Level based on the Australian Height Datum) on the surface while using bearing and distance for the edges, with an isometric drawing provided. A Building Format plan provides an outline of the surface parcel, the building footprint and details of each level while distinguishing between common property and areas of each items such as the main building, patio, balcony, private yards etc. Registration of 3D parcels in the cadastral database: 3D registration is supported by the titling system and 3D parcels are registered as either a Volumetric parcel or as a Building Format parcel. In the digital cadastral database, the strata are shown as an attribute and all 3D related information exists in the plan. Building Format plans are not created for every house, but only those requiring strata title. 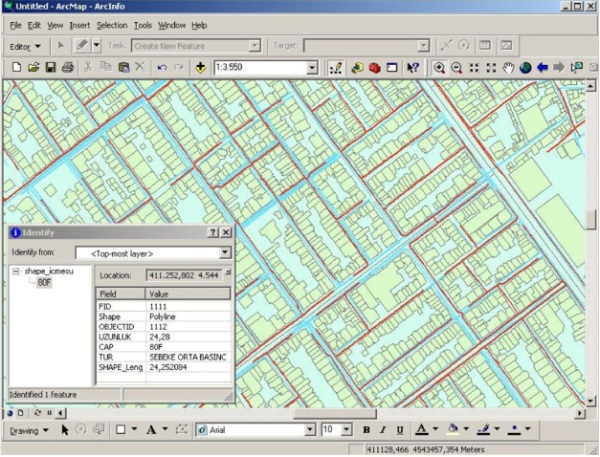 The title database is held separately to the cadastral database and updates are part of a sequential workflow. 3D data is not represented in the viewing tools of the database. Registration of cable and pipeline networks: There seems to be quite a number of ways network parcels are registered in Australia. While some create 3D easements, others subdivide the surface parcels and some do not capture them on plans. 2D parcels generally have a minimum size restriction determined by zoning rules but there is no such restriction on the minimum cross-section size of a 3D parcel. In this section, the preliminary analysis of the survey conducted by the FIG joint commission 3 and 7 working group on 3D-Cadastre, 2010-2014 is presented. In total 36 completed questionnaires have been received and they are all available at the working group website (http://www.gdmc.nl/3DCadastres/participants/). All members of the working group responded with exception of the USA (until) today: Argentina, Australia, Austria, Bahrain, Brazil, Canada, China, Croatia, Cyprus, Denmark, Finland, France, Germany, Greece, Hungary, Indonesia, Israel, Italy, Kazakhstan, Kenya, Macedonia, Malaysia, The Netherlands, Nepal, Nigeria, Norway, Poland, Russia, South Korea, Spain, Sweden, Switzerland, Trinidad and Tobago, Turkey, and United Kingdom. Despite all the efforts to make the concepts used in the questionnaire and the questions asked as clear as possible, we received a few requests for clarification by the respondents. This shows the difficulty (and also the importance) to formulate a clear, standardized definition for 3D cadastre and 3D parcels that will fit all jurisdictions. From the completed questionnaires we received, a number of conclusions can be made. The first is that despite all the research in the past year the concepts "3D cadastre” and “3D parcels" are still ambiguous. The completed questionnaires offer therefore in the first place an overview of the very different ways in which systems of land administration deal with the third dimension of rights (or restrictions). Worldwide there are major differences in those systems, mostly the result of cultural and historical differences in background, and these differences influence the organizational, technical and legal aspects of land registration. Because of these differences, a comparison of the responses is not always easy. A general conclusion is that in all jurisdictions, with the exception of Poland and Nepal, 3D parcels can be registered. But in most cases these 3D parcels are (or even limited to) apartment units. That it is not possible to register 3D parcels other than apartment units in a specific land administration does not mean automatically that it is not possible to create rights that are limited in the third dimension. E.g. in the case of South Korea the respondent explicitly indicated that 3D boundaries of rights are possible by civil law, while cadastral regulation does not touch this subject. In the following paragraphs we give an overview of the preliminary analysis of survey results for several aspects. 5.1 Are all 3D parcels constrained to be within one surface (2D) parcel? Most respondents replied on question 1.1 of the questionnaire that a 3D parcel must be located within the boundaries of a (2D) parcel. This does not exclude that the building to which the right refers may be situated on several land parcels. Possibly - as in the case of the Netherlands - a legal 3D description of right refers to various 2D land parcels. The responses are not always clear on the question what will happen if the land parcel is subdivided later. In Queensland it is the starting point that the 3D parcel must be within the boundaries of a 2D parcel, but this does not exclude that the 2D parcel may be subdivided later on. After subdivision the original 3D parcel continues to exist and therefore stretches out over two or more land parcels. In Norway and Sweden, 3D properties may be created that extend over or under different 2D parcels. In Finland this possibility is foreseen for the future. 5.2 Empty spaces or existing constructions? An interesting question is whether registration of rights to empty spaces - such as air spaces or subsurface volumes - is allowed (e.g. to protect an existing panorama) or that the registered right compulsory refers to an existing or future construction. This topic had been addressed by question 1.3. The responses shows that in most countries explicit rules for this do not exist, but also indicated that in general the rights will refer to a construction. Explicitly the possibility of registration of rights for empty spaces are mentioned in Australia and Canada (Quebec), In Finland this is limited to subsurface volumes. By contrast, Norway and Sweden the law expressly exclude this possibility. In these countries there must be a construction, or a building permit issued for future constructions before a 3D property can be registered. In Norway 3D parcels can be nullified in the case construction has not started building the construction that is going to be the 3D property three years after the building permit has been issued. Generally the boundaries of 3D parcels refer to walls, ceilings and floors. The respondent for France expressly states that - in the absence of guidelines in this area - virtual boundaries would be possible. With respect to the z-axis (height) it appears that in the vast majority of systems directives on this issue does not exist or the height is not registered. Among the countries that do register the height (in survey plans or in a legal deed) it may be observed that Australia and France make use of an absolute level while in Canada (Quebec) and Sweden reference is made to a height relative to ground level. 3D parcels as such do not exist in any cadastral registration. The description of the 3D space will be found in the survey plans or in the legal documents. The standard seems to be that "floorplans" that the boundaries per floor are listed in the title deed or the appropriate public records (Land Book, Land Registry, public records) or survey plans but not in the cadastral database (map). It may be possibly a make a reference to the 3D parcel in the cadastral map in the form of a 2D polygon in a single layer as in the case of Australia, Cyprus (see Figure 4), Croatia (where is spoken of a “2.5D representation”) , Norway and Sweden. In Italy 3D Cadastre in Italy is represented by the Cadastre of Buildings, that exists next to the “Land Cadastre”. This holds an inventory of every building. A very interesting system of 3D registration exists in Spain. Here on the cadastral map a 3D model of the buildings can be shown, including the boundaries of rights inside the buildings. But this is not a 3D representation of the actual height of the units. In fact the representation is based on a standard height of 3 meters from floor-to-floor. Although this is a limitation, this solution does offer a more or less a realistic view of the buildings and property rights within buildings in urban areas, see Figure 5. Figure 5. 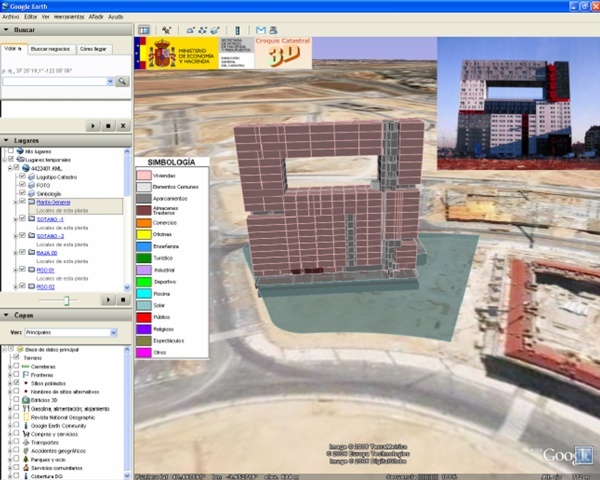 3D visualisation of buildings in the Spanish cadastre (based on a standard floor-to-floor height of 3 meter. Cable and pipeline networks occupy a special place within the registered 3D objects and rights. These networks often extend over several land parcels and thus have - apart from the height or depth of the structure - a 3D character of their own. In recent years the Netherlands introduced the possibility to register rights to all types of cable and pipeline networks. The networks have a cadastral number of their own. In Switzerland, especially in Geneva networks are included in the cadastral database in a similar way. In the Russian Federation, a network can be registered by the Land Registry, but in practice this is not done. In Kazakhstan, all networks are registered "as legal objects". However the respondent also mentions that underground networks are not registered but only shown on maps. Furthermore, in Canada (Quebec) cable and pipeline networks, rail networks are recorded in public registers (Register or real right of State resource development). It can be requested by the owner that the network is displayed on the cadastral plan, but this rarely happens. The network as such can not be found in the cadastral database, but indirectly through the land parcels in which the network is constructed. Figure 6. Turkish example ‘3D utility network’: gas (red) and water (blue) map fragment Istanbul reregistered utility data in combination with cadastral map; translation: ‘uzunluk’ = ‘length’, ‘cap’ = ‘diameter’,‘tur’ = ‘pressure’; source (Döner e.a. 2010). In other countries registration of networks does not happen, or is just possible in limited cases, as in Turkey where only high voltage power lines are registered in the cadastral database. Registration of other networks find place at municipal level, and combined with cadastral data, see Figure 6 example from Istanbul, Turkey. A general registration of (underground) networks does not exist in Norway, where telecommunications, water and electricity networks are not registered, but roads and railways are. Some jurisdictions have "utility maps” (Australia, Victoria) or a" utility register " as Croatia. In the latter country is expected that this register will be integrated in the cadastral database in 2014. Also in other countries we see developments towards the cadastral registration of networks, especially in Denmark, Hungary, Israel and Italy. In the latter country this would take place in the context of pilots projects leading to the development of a subsurface cadastre. The purpose of the survey by the FIG Working group was not only to make a world-wide inventory of the status of 3D-Cadastres at this moment (2010/2011), but also to get an insight in the expectations for the near future (2014). However, the planned developments in the field of 3D cadastre for 2014 seem to be very limited. Whether this means that one is satisfied with the existing system of 2D registration, like the respondent for England and Wales expressly stated, remains unclear. The vast majority of respondents did not answer the questions one the expected situation for 2014. The most concrete developments seems to happen in Switzerland, where in 2014 the concept of 3D plots might be introduced, and Denmark, where the respondent mentions an ongoing discussion of 3D parcels should be recorded in the cadastre and a footprint on the cadastral map. Bahrain mentions the future representation of the apartments in the cadastral database. In recent years in Israel there has been much research into the development of a 3D cadastre and preparations aimed at legislation and it is hoped that this will result in practical changes. As indicated, the solutions for registration of rights with 3D characteristics are very different. Broadly, one can observe that apartments are registered with drawings in the deed registration. But a true 3D registration in the cadastre does not exist anywhere. Most often it was approached by Spain, although the representation uses a standard height per floor layer. Techniques for 3D data acquisition, management and distribution will be within reach. The next step is to optimally exploit this in order to meet the growing information needs in 3D cadastres, matching specific organizational and legal contexts. The international approach of the FIG working group hopes to make an important contribution to reach this, by the publication of “Primer on 3D-Cadastres” providing guidelines for specific contexts and implementations, addressing legal, institutional and technical issues. The authors of this paper would like to express their sincere gratitude to the members of the FIG joint commission 3 and 7 working group on 3D-Cadastres for their joint efforts to complete the questionnaires: Diego Erba, Ali Aien, Don Grant, Mohsen Kalantari, Gerhard Muggenhuber, Gerhard Navratil, Neeraj Dixit, Ammar Rashid Kashram, Andréa Flávia Tenório Carneiro, Francois Brochu, Louis-André Desbiens, Paul Egesborg, Marc Gervais, Jacynthe Pouliot, Francis Roy, Renzhong Guo, Zhang Ning, Shen Ying, Miodrag Roic, Elikkos Elia, Lars Bodum, Esben Munk Sørensen, Christian Thellufsen, Jani Hokkanen, Arvo Kokkonen, Tarja Myllymäki, Claire Galpin, Hervé Halbout, Markus Seifert, Efi Dimopoulou, Gyula Iván, Andras Osskó, Trias Aditya, S. Subaryono, Yerach Doytsher, Joseph Forrai, Gili Kirschner, Yoav Tal, Bruno Razza, Enrico Rispoli, Fausto Savoldi, Natalya Khairudinova, David Siriba, Gjorgji Gjorgjiev, Vanco Gjorgjiev, Alias Abdul Rahman, Babu Ram Acharya, Benedict van Dam, Chrit Lemmen, Thomas Dabiri, Lars Elsrud, Olav Jenssen, Lars Lobben, Tor Valstad, Jaroslaw Bydlosz, Vladimir Tikhonov, Natalia Vandysheva, Youngho Lee, Amalia Velasco, Jesper Paasch, Jenny Paulsson, Helena Aström Boss, Robert Balanche, Laurent Niggeler, Charisse Griffith-Charles, Cemal Biyik, Osman Demir, Fatih Döner, Gareth Robson, and Carsten Roensdorf. Of course, the authors remain responsible for the correct interpretation and the resulting article. Fatih Döner, Rod Thompson, Jantien Stoter, Christiaan Lemmen, Hendrik Ploeger, Peter van Oosterom and Sisi Zlatanova (2010). 4D cadastres: First analysis of Legal, organizational, and technical impact - With a case study on utility networks. In: Land Use Policy, Volume 27, pp. 1068-1081, 2010. ISO (2011), ISO 19152. Draft International Standard (DIS), Geographic information — Land administration domain model (LADM), Geneva, Switzerland, 20 January 2011. Peter van Oosterom obtained an MSc in Technical Computer Science in 1985 from Delft University of Technology, The Netherlands. In 1990 he received a PhD from Leiden University for this thesis ‘Reactive Data Structures for GIS’. From 1985 until 1995 he worked at the TNO-FEL laboratory in The Hague, The Netherlands as a computer scientist. From 1995 until 2000 he was senior information manager at the Dutch Cadastre, were he was involved in the renewal of the Cadastral (Geographic) database. Since 2000, he is professor at the Delft University of Technology (OTB institute) and head of the section ‘GIS Technology’. He is the current chair of the FIG joint commission 3 and 7 working group on ‘3D-Cadastres’ (2010-2014). Hendrik Ploeger studied law at Leiden University and the Free University of Amsterdam, The Netherlands. In 1997 he finished his PhD-thesis on the subject of the right of superficies and the horizontal division of property rights in land. He is associate professor at Delft University of Technology (OTB Research Institute) and holds the endowed chair in land law and land registration at VU University of Amsterdam. His research expertise focuses on land law and land registration, especially from a comparative legal perspective. Rod Thompson has been working in the spatial information field since 1985. He designed and led the implementation of the Queensland Digital Cadastral Data Base, and is now principal advisor in spatial databases. He obtained a PhD at the Delft University of Technology in December 2007. Sudarshan Karki is senior Spatial Information Officer, Cadastral & Geodetic Data (Survey Information Processing Unit), in the Data Management & Acquisition, Spatial Information Group of Department of Environment and Resource Management, Queensland Government, Australia. He completed his professional Masters Degree in Geo-informatics from ITC, The Netherlands in 2003 and is currently doing Master of Spatial Science by Research at the University of Southern Queensland.